Little Nero is a lost neurotransmitter who just found himself atop a receptor of the receiving dendrite and needs to get his charge to the neighboring neuron…i need detailed instructions to Little Nero so he is able to reach a successful action potential?? A neuron is an electrically excitable cell that processes and transmits information by electrochemical signaling. 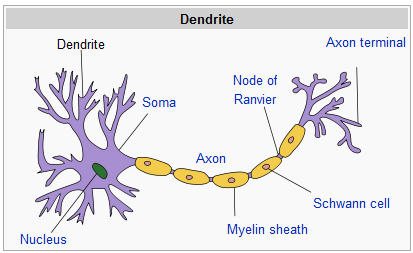 On one end of the neuron are the dendrites (receiving end) and the other end is the transmitting end (axon terminal). Synapse: One neuron connects to another neuron when the dendrite of one is connected to the axon terminal of the other. This connection is called a synapse. Dendrites are the branched projections of a neuron that act to conduct the electrochemical stimulation received from other neural cells to the main part of the neuron from which the dendrites project. Dendrites form the main receiving part of neurons. Dendrites collect and funnel these signals to the soma and axon. A neurotransmitter is a chemical that is released from a neuron. Receptor: Neurotransmitters cross the synapse where they may be accepted by the next neuron at a specialized site on a dendrite called a receptor.